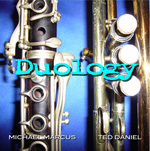 Duology pairs multi-instrumentalist Michael Marcus and trumpeter Ted Daniel in a series of unique, vibrant duets. Eschewing his usual arsenal of horns, Marcus limits himself to B-flat clarinet, while Daniel alternates between a few members of the trumpet family for subtle variety. With a selection of brief skeletal miniatures, Marcus and Daniel deliver a snapshot of jazz history, from its syncopated Dixieland roots to AACM-influenced abstraction. Both seasoned veterans, Marcus and Daniel use these fundamental tools of the jazz canon to generate everything from lyrical ballads and swinging counterpoint to avant-garde textures. The resonant woody timbre of the clarinet provides a supple contrast to the brassy bite of the trumpet, while muted horn punctuations offer a honeyed buffer to the clarion call of the tiny reed's upper register. 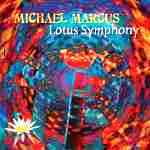 Marcus penned half the tunes; the rest are divided between Daniel's compositions and free improvisations. Whether soloing in unison over quirky themes or providing supple support, these two players maintain focus on often knotty structures. Although the limited instrumental palette might seem constraining on paper, in reality they offer a surprising array of sounds. Beyond the reminiscences of early Dixieland, the clarinet/trumpet combination recalls the dynamic John Carter/Bobby Bradford partnership of the early 1980s and the rich polyphonic angularity of the classic Ornette Coleman/Don Cherry front line. Regular collaborators through the 1990s, after being introduced by Frank Lowe, Marcus and Daniel pay homage to the iconic tenor saxophonist on the aptly titled "Sweet 'N' Lowe," a sultry blues meditation that slides easily alongside the casual swing of "Lunar Shuffle." On the jaunty riffing of "O.C.," they prove that swing isn't dependent on an actual rhythm section so much as implied rhythm. Their dialogue is rich, yet never verbose, as evident on the pensive "Spiral Landscapes." A turbulent outré side is revealed on the circuitous interplay of "Module" and the visceral sonic labyrinth of "Wiggle Room." Dedication to the tunes' structure never falters, however, whether blending Old World swing with freewheeling expression on "Knock Knock" or exploring the extreme outer limits of sound on "Dark Sun" and "Rhythm in Green." Duology might not be for all tastes, but for those in search of deep listening and intense improvisation, it's hard to beat. Track Listing: Knock Knock; Sonic Corridors; Dark Sun; O.C. ; Spiral Landscapes; Module; Pagan Spain; Wiggle Room; Human Factor; Lunar Shuffle; Cotton Candy; Sweet 'N' Lowe (for Frank Lowe); Rhythm In Green. Personnel: Michael Marcus: clarinet; Ted Daniel: trumpet, flugelhorn, Moroccan bugle, cornet.